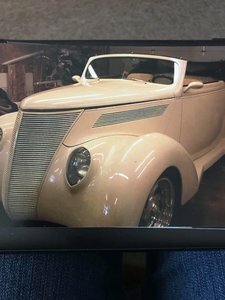 1937 FORD CABRIOLET RESTO MOD.......CUSTOM BUILD CHEVY V8,200r TRANS,INDEPENDENT SUSPENSION FRONT N REAR BY PHX INDUSTRIAL CHASSIS, 4 WHEEL POWER DISC BRAKES! 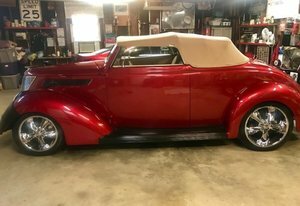 FLAMING RIVER POWER RACK,VINTAGE AC, HEAT, POWER WINDOWS,, HEIST FRONT, SMOOTH RIDE, HAS STEEL HOOD N SIDE COVERS, GIBBONS BODY, ONLY HAS 4,300K MILES SINCE BUILD.NICE CLASSY CRUISER, , TITLE IS REAL 1937. Please Note The Following **Vehicle Location is at our clients home and Not In Cadillac, Michigan. **We do have a showroom with about 25 cars that is by appointment only **Please Call First and talk to one of our reps at 231-468-2809 EXT 1 ** FREE Consignment Visit Our Site Today Easy To List Your Vehicle and Get it Sold in Record Time.